When did you discover anime? Share as much as you remember. I first discovered anime when I was in late elementary school or early middle school. My first brush with it was with Sailor Moon in 1995. I distinctly remember getting up really early in the morning, at around five or six, and sneaking downstairs after my dad left for work to watch it on FOX. I fell in love with it and eventually watched most of Sailor Moon and Sailor Moon R on the staticky USA Network in 1997. Technically, I suppose, I also saw The Last Unicorn when I was young, and although it’s not a Japanese cartoon, per se, the animation was done by Topcraft. I also watched ThunderCats and other ’80s cartoons on television that had ties to Japanese animation studios. What appealed to you about anime when you first discovered it? Something about Sailor Moon stirred my imagination. When I first started watching the show in 1995, I didn’t know what anime was. I remember thinking that the style of the animation seemed different from most shows on television. I remember thinking that the setting seemed different somehow from my suburban hometown. Initially, I did not know that Serena/Usagi lived in Tokyo, and I remember wishing that I could wander around my town like Usagi, visiting jewelry stores, cake shops, and Crown. I also remember wondering why all the girls wore sailor suits. And I remember really wanting Usagi’s Mary Jane shoes and her black satchel school bag, except that I could never find them at the mall. Usagi was one of the first female cartoon characters that I could really relate to, and I became enthralled by all the magic and lore in the story. What would you say was the most popular anime at the time? Pokémon and Digimon definitely were more popular than Sailor Moon, at least among my male classmates. None of the girls I knew watched anime. Also, YuGiOh! became popular later. What was it like to be a part of anime fandom at the time? There wasn’t much of a fandom to be a part of, at least, none of my friends watched Sailor Moon. I didn’t get AOL and dial-up internet at home until 1998, so I didn’t really learn more about Sailor Moon and other anime like Escaflowne, which I also loved, until then. I joined some webrings and connected with some people through Neopets, but again, I didn’t really know anyone who liked anime until I went to college. There I watched Adult Swim, went to my first anime convention, and occasionally visited my college’s anime club. I finally made friends who also loved anime! Crunchyroll soon became popular after that, and, obviously, now I get most of my fandom kicks from the internet and anime cons. You didn’t meet other fans until you went to college. How did that work out? I’ve always been a bit nerdy. I’ve always gotten into books, movies, and video games more than my classmates. My parents met in the ’70s playing D&D after all, so I’ve never been adverse to geeky pursuits, but in high school, I kept most of my interests to myself. Perhaps there were other girls interested in anime and manga, but I didn’t know any of them. In college, it felt like everyone was out to be themselves, to wear their hearts on their sleeves, so I embraced my geekiness and found friends who were also interested in anime. A couple of them are still my friends 10 years later, and my husband who I met in college is also an anime fan, so I’d say that it worked out well! Did you stay a fan the whole time up until today? If yes, what kept your interest? If no, what got you back into anime again? I’d say that I’ve been an anime fan ever since I saw Sailor Moon in the ’90s, but I probably had a small break in high school, since no one else I knew watched it. Also, there was a lot less anime on TV then, and I didn’t have cable, so I sort of stopped watching for a couple of years. College was an excellent time to get back into it, since, like I said, I met other people who liked it, and my college had cable TV. In the end, however, it was probably my first anime con in 2007 that really inspired me to fully embrace the anime fandom. Can you tell me more about early internet fandom? Were there particular sites or forums you visited? It’s difficult for me to remember all of the sites I visited back in the day. Many of them don’t exist anymore. I remember visiting a lot of Expage.com and Geocities websites. Some of them had scanlations of all of the Sailor Moon manga and artbooks, some of them had GIFs of sprites from the Sailor Moon video games, and some of them had fan art. But they were hard to find. Webrings helped, but it still wasn’t that easy, so if Tumblr had existed back then, I would have been addicted! I also spent a lot of time on LiveJournal, but what I sampled there was more like personal blogs than fan blogs. I didn’t participate in too many forums, no anime forums at all, although I did spend a lot of time on the Cittàgazze website and forum, a community for His Dark Materials fans, as well as The Lord of the Rings Fanatics Plaza. What was the first fandom you got really invested in? How did you express your fandom? Definitely Sailor Moon! The Sailor Moon fandom feels ancient at this point. It’s 20 years old! And although I never really talked to other Sailor Moon fans until I became an adult, I’ve always felt like I was a part of the community. When I first started watching the show, I couldn’t really express my fandom; I didn’t have any money, and it was difficult to find Sailor Moon merchandise. But now I can, and I have done so by purchasing the entire series, as well as many of the manga volumes. I’ve also written about my love of Sailor Moon for Women Write About Comics a number of times, as well as my love of other anime at Girls in Capes. 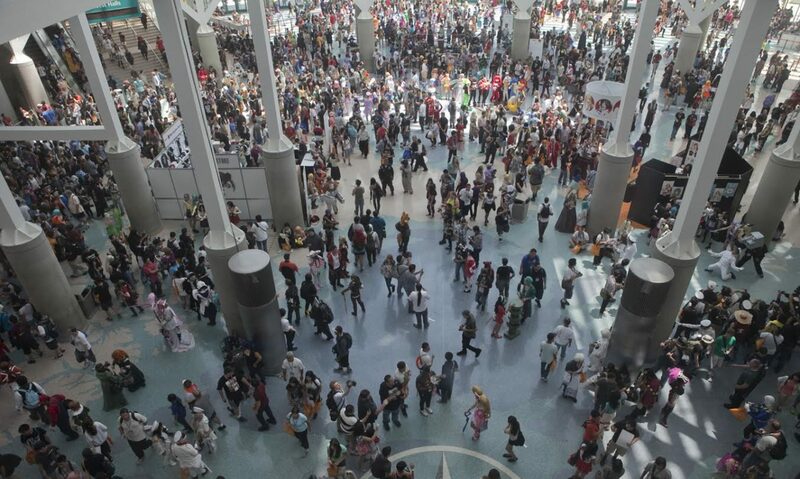 Do you remember your first anime con? If so, what was it like? My first anime con was Tekkoshocon in 2007. Tekko is a small con hosted in Pittsburgh. When I went, there were about 2,500 attendees, a small number compared to cons I’ve attended since, but it was the perfect size for a newbie back then like me. I had been reluctant to go initially, but I had a lot of fun in the end. The con allowed me to experience everything an anime con has to offer, and I got to talk to a lot of like-minded people. I remember the video rooms were my favorite part. I got to sample anime I had never heard of before, from classics like El Hazard: The Magnificent World to newer shows like Elfen Lied. Now when I attend anime cons, I tend to avoid the video rooms, because they only play shows I’ve already seen, but back then, it was a learning experience. What’s the biggest contrast between anime fandom then and anime fandom today? I think there are two things that make the anime fandom today different and even better than it was in the past. Firstly, access to anime is easier now than it ever was before. I always relied on television channels for my anime when I was young, which made watching a series in order very difficult. Lots of anime in the ’90s were highly Americanized and heavily edited for broadcast TV. American producers and distributors even cut some episodes completely, because they felt that their content was inappropriate for young American audiences. And although sometimes translations of subtitles are changed and censored today, the American anime industry is a lot more transparent than it used to be. The internet changed everything! Secondly, anime and other geeky pursuits have become more mainstream over the last decade or so, which has made the pursuit of anime more fun than ever. Being a geek is more socially accepted, and so going to cons and talking to other fans and expressing your fandom in how you dress, how you decorate your living spaces, and how you spend your time and money is so much more fun! The anime fandom feels like a big family of like-minded people, and although many of my internet friendships are sort of abstract and tenuous, they make me smile every day. Rine can be reached on Twitter.